As manager of the Digital Advisory portfolio within DAI’s Center for Digital Acceleration, Anand Varghese works with clients to develop digital strategies, design and implement digital-focused activities, train staff on the use of digital platforms for development, and identify local partners. Since 2016, he has served as a technical advisor to the Kosmos Innovation Center (KIC) in Accra, Ghana, where he helps young technology entrepreneurs develop digital solutions for the local agricultural sector. He also teaches a course on ‘Digital Development: Innovative Use of Technology in Emerging Markets’ at the Johns Hopkins School for Advanced International Studies. Prior to joining DAI, he served as Senior Manager at the PeaceTech Lab at the U.S. Institute of Peace. Anand played an integral role in creating and launching the Lab, the Institute’s first nonprofit spin-off in its 30-year history. 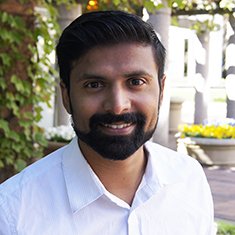 Anand has managed various technology-related development projects, including the first nationwide mobile phone-based survey in Afghanistan, workshops for youth activists on crowdsourced mapping tools, and partnerships with universities to integrate young engineers into conflict management. Anand speaks regularly at international conferences and has authored studies on topics at the intersection of digital technology and international development. He hails from Bangalore, India.